Posted February 15, 2018 by Aaron Cox & filed under Landlord-Tenant Law. Having to evict a tenant is a position that no landlord wants to be in, but that every landlord should be prepared for. In the event that you need to evict a client, it may be important for you to move fast in order to prevent further damage to your property. This means that you should have a clear understanding of the legal policies and procedures governing eviction in Michigan. Let’s start by clarifying what constitutes legal grounds for eviction under Michigan’s landlord-tenant laws. A tenant can legally be evicted for a number of different reasons, including nonpayment of rent, causing damage to the property, engaging in illegal conduct on the premises or failing to move out after the lease agreement ends. A tenant cannot be evicted in retaliation for exercising their legal rights, however, such as reporting safety hazards to a building inspector. 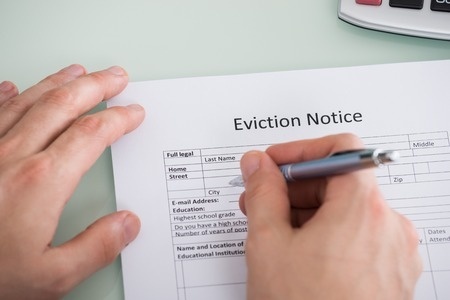 Landlords are required to serve tenants with legal notice to begin the eviction process. This notice must advise them of the reason for the eviction, and provide them with a deadline for moving out of the property. If the tenant is being evicted because of a failure to pay rent, the landlord must serve them a 7-Day Demand for Nonpayment of Rent. For other common lease violations, tenants must be served with a 30-Day Notice to Quit instead. If a tenant fails to move out by the deadline established in the eviction notice, the landlord can file a complaint with their local district court. After the court reviews the complaint, they will issue a summons to the tenant outlining the reasons for eviction and advising them of the date and time for their court hearing. Both the landlord and tenant must attend this hearing. If the court rules in the landlord’s favor, the landlord will receive a judgement against the tenant requiring them to move out of the property and pay any remaining rent due. Still have some lingering questions about Michigan’s landlord-tenant laws? Feel free to give us a call or contact us online to schedule a consultation today.